The maverick Sanjay Dutt shoots a six page courtroom scene in one take! 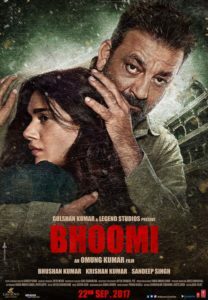 After a long hiatus Sanju Baba is going to be seen scorching screens with his upcoming revenge drama Bhoomi. A large portion of the film has been shot in Agra except for a courtroom sequence which was shot in Mumbai. The sequence entailed a six page long emotional scene with powerful dialogues. The day it was to be shot, Sanjay Dutt was busy making the cast and crew laugh which made the producers Bhushan Kumar and Sandeep Singh weary of shooting this hard-hitting scene. At 7.30 pm as the cameras rolled Sanjay Dutt stood and shot the entire scene in just one take leaving everyone spellbound! The cast and crew were left teary-eyed as they waited for director Omung Kumar to say ‘cut’!